The National Company of Cambridge, Massachusetts, was one of the first large distributors of electronics components and appliances. It began life as the National Toy Company. Under the leadership of Mr. James Millen, W1HRX, National quickly became a market leader in designing and marketing high quality radio products for both amateur radio operators and casual listeners of shortwave radios. National Company very often ran full-page advertisements in the American Radio Relay League's QST magazine, that were more in the form of an infomercial than pure product promotion. This one, number 98 in a very long-running series, extolls the virtues of their famous NSM Modulator. The majority of these ads were written my Mr. Millen, but in this case it was done by Calvin Hadlock. 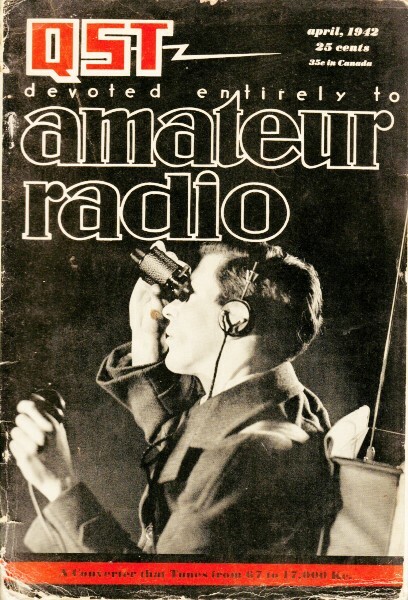 A bit of trivia: National Company was the first paid advertiser in The Radio Amateur's Handbook. 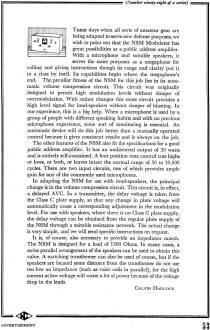 These days when all sorts of amateur gear are being adapted to serve new defense purposes; we wish to point out that the NSM Modulator has great possibilities as a public address amplifier. With a microphone and suitable speakers, it serves the same purposes as a megaphone for calling and giving instructions though its range and clarity put it in a class by itself. Its capabilities begin where the megaphone's end. The peculiar fitness of the NSM for this job lies in its automatic volume compression circuit. This circuit was originally designed to permit high modulation levels without danger of overmodulation. With minor changes this same circuit provides a high level signal for loud-speakers without danger of blasting. In our experience, this is a big help. When a microphone is used by a group of people with different speaking habits and with no previous microphone experience, some sort of monitoring is essential. An automatic device will do this job better than a manually operated control because it gives consistent results and is always on the job. The other features of the NSM also fit the specifications for a good public address amplifier. It has an undistorted output of 30 watts and is entirely self-contained. A four position tone control cuts highs or lows, or both, or leaves intact the normal range of 50 to 10,000 cycles. There are two input circuits, one of which provides ample gain for any of the commonly used microphones. In adapting the NSM for use with loud-speakers, the principal change is in the volume compression circuit. This circuit is, in effect, a delayed AVC. In a transmitter, the delay voltage is taken from the Class C plate supply, so that any change in plate voltage will automatically cause a corresponding adjustment in the modulation level. 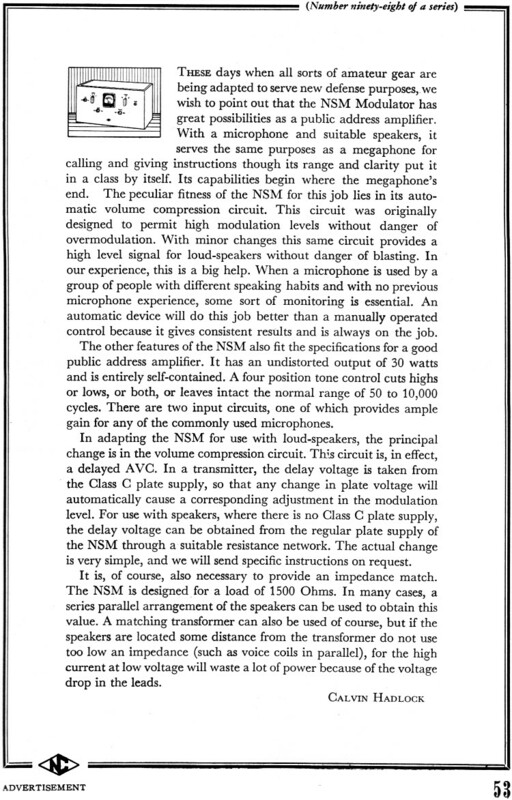 For use with speakers, where there is no Class C plate supply, the delay voltage can be obtained from the regular plate supply of the NSM through a suitable resistance network. The actual change is very simple, and we will send specific instructions on request. It is, of course, also necessary to provide an impedance match. The NSM is designed for a load of 1500 Ohms. In many cases, a series parallel arrangement of the speakers can be used to obtain this value. A matching transformer can also be used of course, but if the speakers are located some distance from the transformer do not use too low an impedance (such as voice coils in parallel), for the high current at low voltage will waste a lot of power because of the voltage drop in the leads.